Child Development and Storytime: Depth Perception and the “Overboard” Game! I love to tell my storytimers that their babies are scientists, and for them, every interaction is an experiment. They’re always trying to answer the question of “what will happen if I…” and with each result, they’re gathering statistics. (If I cry, most of the time something good will happen. I will get snuggles or food or maybe a toy.) Between 4-8 months, things start to get interesting as baby’s spatial awareness begins to develop and, for the first time, she begins to show depth perception. All of a sudden, she’s aware that the changing table is kind of high and she could fall. Ahh! But she’s also starting to understand that objects behave in a certain way when height, distance, and force are involved. I see this all the time with the very popular Overboard Game. In “Overboard,” a baby takes whatever objects are handy and throws or drops them. This is absolutely delightful to them if there’s some kind of drop or ledge to use, too. Got a toy in the crib? It’s going overboard. Did you carefully place a sippy cup on the high chair? Overboard! Did you give baby your keys to jingle while you push them in a stroller down the grocery aisle? They’re going overboard, too. Just watching this happen in the narrow time windows I’m allowed is exhausting, so I can only imagine how nerve-wracking it must be when it’s happening all. day. long. This is why I think it’s fun to share with parents that this is a normal, healthy part of baby’s development and that–hey, everytime baby throws something, he’s experimenting in basic physics AND figuring out if he likes the way you react. This is all innocent play for him, but it’s also serious business in building the way he communicates and relates to you. If you’re doing storytime for babies, there’s a couple ways this could come up. Do you remember Nintendo? Do you remember when Super Nintendo came out and things looked better but then…OMG DONKEY KONG COUNTRY?! There were graphics and dimensions in that game that you didn’t know could exist and it blew everybody’s mind. That’s kind of what your baby is experiencing right now and he is amazed because, not only do those dimensions exist, but they’re bringing him closer to you. So, there you have it. I’m not a child psychologist or a cognitive/behavioral scientist, so there are lots of people who are more expert than me. I hope this comes in handy nonetheless. Today I’m presenting at the NCLA conference along with three amazing library friends: Lisa Neal, Carole Dennis, and Melissa Hager. Here are some notes from our presentation that will remind you of the fun ideas we’ve shared. Please leave a comment with anything you’d like to add! Let’s make growing in our skills a group effort. My post for my favorite extension activities. Hi, my name is Brytani, and I’m baby-impaired. So I set about learning how to provide a baby storytime and took the most tenuous steps in my career. I was SO ANXIOUS, but now that I’ve been learning and practicing for several months, I’ve started to feel slightly more comfortable. So, if you’re feeling uncertain about a baby storytime because you’re nervous about babies, please let me make you feel a little better. Jbrary–their baby playlist and their fantastic guides for beginners. Click here for all their posts about baby storytimes. You’ll be so glad you did. Dana and Lindsey, I love you! Reading with Red– so many great ideas for baby play AND toys for playtime AND posts about her favorite books to read. After trying out a few plans from different people, I found I was most comfortable with Brooke’s style. My storytimes still look a lot like her outline here. Read Sing Play– Did you know that Kendra has a page where she’s recorded herself singing the songs she does in storytime? So helpful for me! I use them all the time and you can find them here. Abby the Librarian– She has the best, best, best lists of books to read. Find all her baby-related posts here. 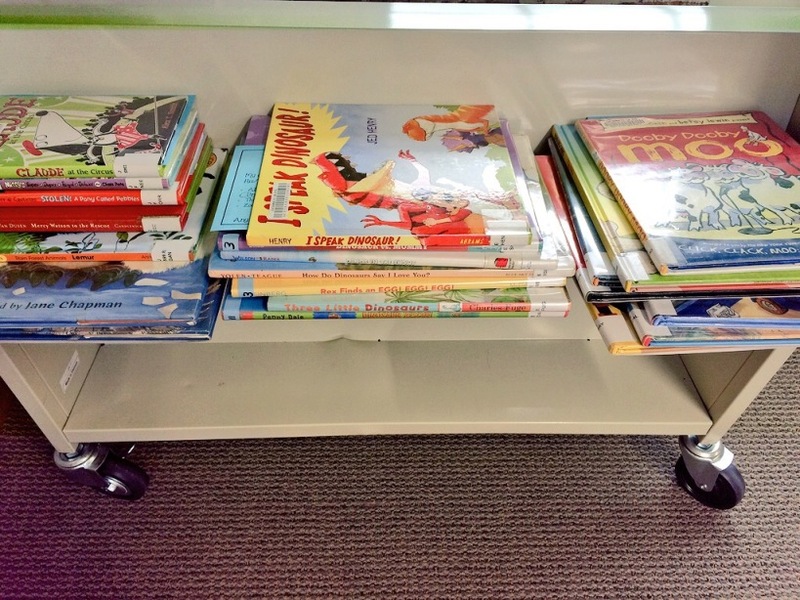 Mel’s Desk– You really absolutely must read her posts about baby storytime and stock up on all her perfect early literacy messages. When I was getting started, her outlines made me feel so much better because, actually, they’re not very much different from what I do with older kids. Seeing them helped me realize that I could use some of the same activities and just make it simpler or slower for babies and that put me so much more at ease. These bloggers can help you figure out what to read, what to sing, and how to play and talk, so I want to address the things that I know happen inside a baby-impaired brain. Anxiety #1: Babies will smell my fear. I was terrified that babies would immediately hate me and start crying and maybe even projectile vomit on me. Seriously, that was a thing in my mind. Well, babies aren’t really that sensitive. I mean, they’re a little volatile near nap time or when they’re hungry/uncomfortable/mad (aren’t we all? ), but they get over things pretty quickly, too. Full tantrum can be soothed with just one bubble blown, my friends. Remember that you’re magical to them and that smiling and singing is the way to any baby’s heart. Just be happy to see them and as they begin to see you more often, you’ll find out what their favorite things are in storytime and you can whip that out anytime things are taking a turn for the worse. Anxiety #2: Parents will think I’m weird. I’ve found this to be the opposite for me. Parents who bring their kids to baby storytimes are pretty likely to have been socializing their kids to different things. So they’re probably thankful to you for giving them a chance to see other moms and dads and they probably also want to see their kids getting more comfortable with trustworthy adults, which includes you. Plus, I’ve found that most parents coming to baby storytimes are first time moms, and that means they were no different from you not too long ago. When the moms in my group found out I don’t have any babies in my life, they started inundating me with stories about first time motherhood. So, yeah, I think they realize I’m still a little awkward with babies, but they get it and they want me to know about things they didn’t know. Anxiety #3: Parents won’t like me giving literacy messages. Complete opposite as well. After talking a lot about how I don’t have kids but study their development, parents have really soaked up the messages I give them. They realize that they get in a routine of doing the same things and they like having someone on the outside to remind them of things or suggest trying something new. I’ve found literacy messages are wonderfully received in baby storytimes and since I don’t have to worry about losing the babies’ attention spans while I talk with them, I’ve found it a lot easier for me than in older storytimes. I really like to pick out toys they probably have at home and show them how to use it in a different way and that’s really easy to demonstrate without a baby. Anxiety #4: I won’t know when it’s okay to touch. I think I’ve been made really paranoid about this because I used to work for a library that had a very rigid no-touching-ever-ever policy. I get where that policy comes from, but it really does ignore a child’s developmental need to reflect affection and you see really powerful connections with learning when kids feel safe and loved. Typically, I only hug back. Older kids can make it clear that they’re going to hug you one way or another, and I always reciprocate in that case. But with babies, their body language can be so different. They might back right into your lap when they want to be held, they might hold out their hands for you, or they might just sit on your feet and give you big eyes. Most of the babies in my group have a pretty good sense of stranger danger, so they mostly don’t want to be held, but they do like holding my hands and using me as furniture to balance on. On the rare occasion that a baby does want me to hold or lift him, I always make eye contact with the parent to make sure it’s okay. A couple times I’ve been uncertain about what a baby wanted and mom said, “he wants you to help him stand, but then he’ll want you to run with him, so…good luck with that.” And a couple times I’ve seen a mom hold her baby back from touching other people. I think you’ll be able to read the signs and know when it’s comfortable for the parent or not. Now here are some tricks to help you feel a little better. Trick #1: Do an introduction song and make your example baby something funny. I do Let’s All Clap and start with my Folkmanis sheepdog puppet, Magoo. I explain that my dogs are currently my babies so he’s a fitting choice. Almost all of my attendees are dog-people, so they enjoy asking me how my dogs are doing. Trick #2: Clap a lot! For a long time, after every book, we would all clap and say, “The end. Yayyyy!” Babies love the clapping and it makes you feel good at the same time. Trick #3: Leaning on manipulatives can be helpful until you get your rhythm going. I used to rotate doing shaky eggs, scarves, and bubbles in each storytime because parents commented that they liked that a lot. Now I open with Hello Bubbles and end with peek-a-boo with scarves. I’ve also found that Hello Bubbles is a great thing to do before a flannel activity because the babies are so distracted with popping the bubbles that they don’t try to get your flannel pieces as you’re putting them up. Trick #4: You really can use some of the activities you do with older kids. You just want to make sure any props are big enough for them to see and that you sing/speak slowly and clearly. A good example might be my Bubble, Bubble, Pop prop song. 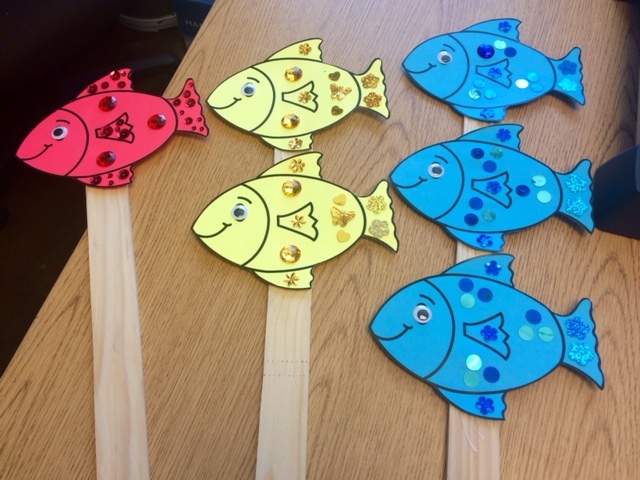 The fish are big and it’s a simple song about counting to three, so I just sing it more slowly and show parents how to make the fish with their hands. Five Elephants in the Bathtub is another that I do with babies, toddlers, and preschool. For babies, instead of using flannel pieces, I use props with stuffed elephants and a little tub.The stuffed elephants are bigger and more interesting to them. I think that might be everything I’ve learned so far. I know it’s not much, but I hope it helps to hear that you’re not alone and that it gets easier. Good luck out there! Look! I’m finally writing a Flannel Friday post! This week I finally completed by fish props for the song Bubble, Bubble, Pop. I learned this tune from Jbrary! If you haven’t given it a try, it’s very fun. My mixed age crowd adores it. These are six fish (about four inches tall and 6 inches wide) that have been printed on cardstock, decorated, and then glued to giant paint-stir sticks that I got from Wal-Mart. I can’t remember the exact price of the sticks, but I feel like I got them each for less than .50 cents. To use the props, I just hold the sticks in my lap while I sing, lifting the appropriate one when it’s their turn and waving them like they’re swimming. At the end, I lay them down in my lap again and blow bubbles for the kiddies to pop. This makes a great “intermission” activity because it’s highly interactive and gets the kids moving and honing those motor skills by popping bubbles. Expanding on Storytime with the Book Genie! It takes place before hours, at 11 am on a Tuesday. That means that, although I arrive at 10 am, if a parent tries to call that morning to confirm the details of storytime, we’re not answering the phone yet. Also, our doors are locked remotely by controlling magnets that run through the frame. We do not physically lock or unlock them–our partners in City Hall control it all. If a parent arrives at 10:59 and tries to enter through the side of the building where parents have not lined up, they won’t be able to get in and they will likely think it’s not happening and leave. Tuesday, as it happens, is my first working day each week. Adding that storytime takes place before hours, this means that it’s the very first thing I do every week. I have one hour to get ready, so I have to make sure as much as possible is ready the week before, and that is easier said than done, my friends. At least once a month, I have a meeting to attend at 8:30 am on Tuesdays. On those weeks, I leave the meeting at 10, speed over to my branch, set-up for and lead storytime, work through the busiest day of the week, and leave when we close at 8 pm. So…this set-up is not my favorite, but I put up with it because my storytime, I think, is very well attended for a small branch in a small town, and I’m just anxious about messing with that. (Our population is around 25,000, this branch is just under 3,000 sq. feet, and I typically have between 20-30 people). In light of all of this, offering even more for these families might seem a little over the top. And, truthfully, it is. BUT! It’s also super rewarding and the best part of my week. So I soldier on. So I started a book-bundling service that I call the Book Genie. I’ve been piloting this program for a few weeks now, so I’ve gained some wisdom and hindsight that’s been helpful. 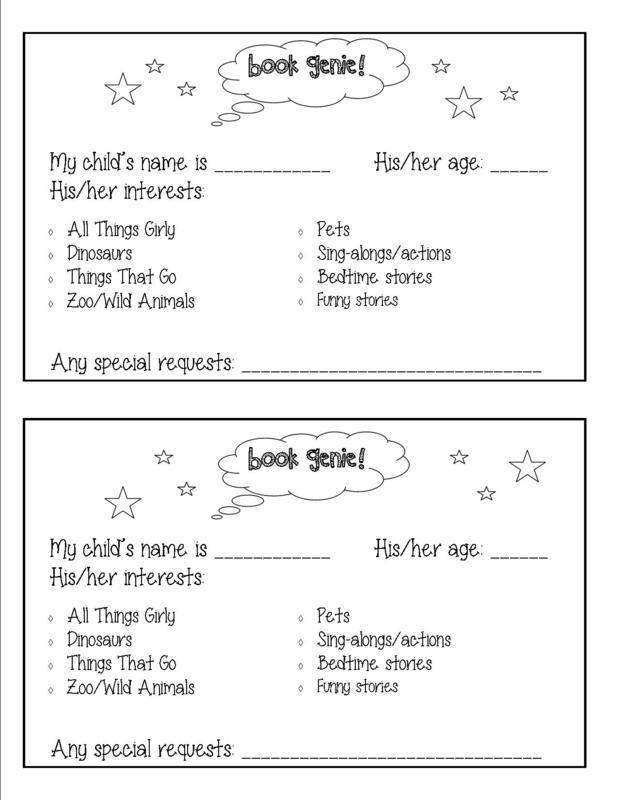 Parents and caregivers have the option of filling out a slip that briefly describes their children’s ages and reading preferences. Currently, I have eight general and popular themes for them to choose from. They can circle as many themes as they want. There’s also a line at the bottom to include special requests and other notes. I collect the slips and, over the next week, I select seven books for them to check out and take home (unless they note that they want more or less). I keep them in little stacks on an empty cart behind my desk because I have a tragic lack of storage space. 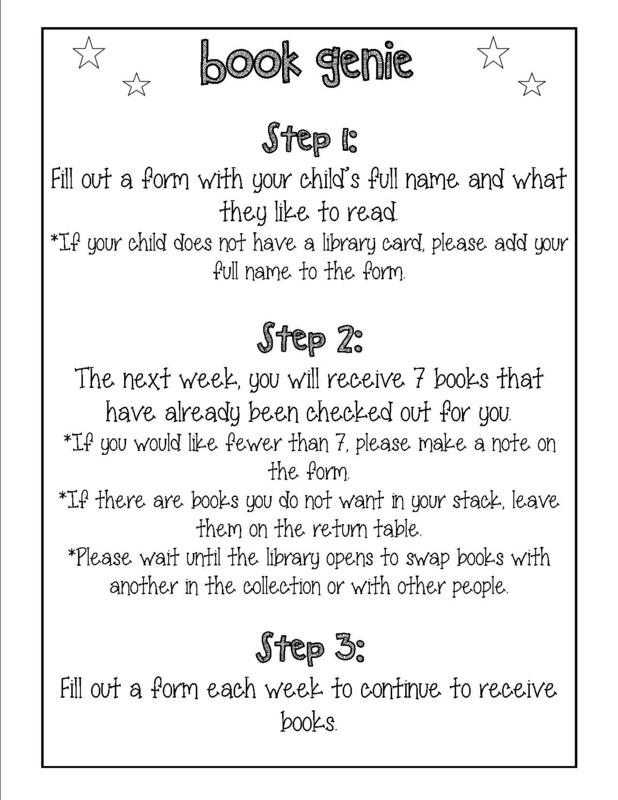 I leave the slips in the stacks so that I can just carry them to a table for storytime and have the child’s name along with what they asked for handy. I do check them out to the child or caregiver before storytime so that there’s zero need to wait for the branch to open. To make sure that I don’t give the same child the same books back to back, I take photos of the stacks and compile them into a list in Evernote that I organize by weeks. It says something like, “Kevin, 5/4, dinos and cars [picture].” This feels like a crude system but I’ve found it slightly faster than typing in each individual title and I like the visual reference. Of course, when I’m selecting books, I’m thinking about what’s appropriate for the child’s age along with what I know about him/her from storytime. I’ve known a lot of my kids long enough that I can predict what titles will be a hit with them. I keep that information in mind when selecting. This service has always been about getting books to the kids who have a hard time returning to the library later. For many of my families, storytime is the only time that they can visit, but for a handful, it’s easier to return some other time and pick books together. After my second week, I got a little blowback from grandparents who didn’t like the books I picked or the system I had in place. At first, it ruffled my feathers, but after some reflection I realized that these are people who just have more time to select books together with their child and that’s why they’ve learned to be more selective. I cannot top a caregiver’s close knowledge of their child’s needs and preferences, but I can make it easier on others who wouldn’t have books without me. So this is not for everyone. Pickier families will have a better experience skipping this and I think it’s okay to say that (in a nice way) if anyone wants to criticize. This probably should have been obvious to me, but I needed to have instructions and rules posted in the area where they fill out the slips. When I introduced the Book Genie, I just went over it verbally at the beginning of storytime and let parents and caregivers help each other by word of mouth. That model was going okay, but I quickly found a need to express my limitations when parents were wanting to swap books with each other (that were already checked out) while I was still setting up for playtime or helping with crafts. It was too much for my brain to handle. Now I have rules posted to make it clear that they get what they get and they don’t throw a fit, at least until I’m all done cleaning up and back at my desk. 3. This is a great way to increase your circulation and card memberships. My enrollment in this varies from week to week, but regardless, the increase in circulation is a big perk. Also, once parents and caregivers realized their kids could have cards, several of them joyfully signed up their children. Those kiddos are such proud owners, too! They got their card from someone they know and trust rather than a random circulation assistant, so their connection is that much stronger. 4. You need to plan the time it takes to check out the books and set them up in your prep time for storytime. 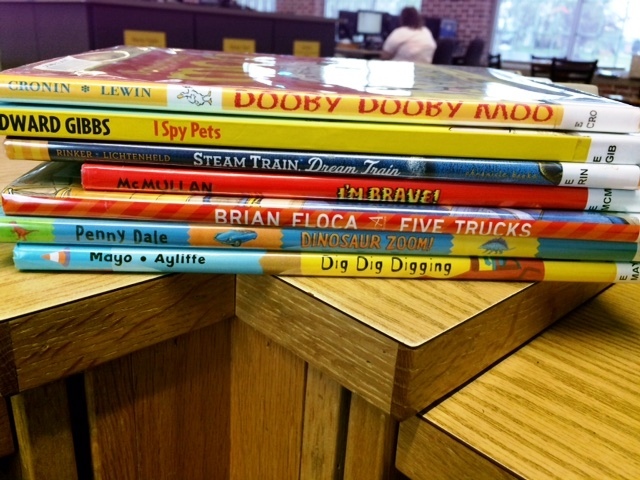 If I have ten kids participating, I check out 70 books and carry them in neat stacks into the storytime area for set-up. That adds at least 20 mins to my prep time. It’s been quite a learning experience and I’m sure I’ll still be making adjustments for awhile yet. 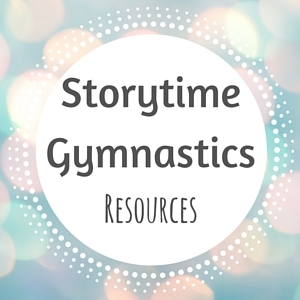 Are you expanding on storytime with special services? Tell me all about it! Feel free to steal any of this.